Is Paypal Holdings Inc (PYPL) A Good Investment Right Now? Is Paypal Holdings Inc (NASDAQ:PYPL) a good investment right now? We check hedge fund and billionaire investor sentiment before delving into hours of research. Hedge funds spend millions of dollars on Ivy League graduates, expert networks, and get tips from industry insiders. They sometimes fail miserably but historically their consensus stock picks outperformed the market after adjusting for known risk factors. Paypal Holdings Inc (NASDAQ:PYPL) has seen an increase in hedge fund sentiment of late. It looks like hedge funds are riding Dan Loeb’s coattails after he pitched the stock in his second quarter investor letter (we shared his thesis below). Consequently PayPal is now the 12th most popular stock among the 694 hedge funds that disclosed their Q3 holdings recently (check out the list of 30 most popular stocks among hedge funds now). In the financial world there are a large number of tools investors have at their disposal to grade stocks. A pair of the most under-the-radar tools are hedge fund and insider trading indicators. We have shown that, historically, those who follow the top picks of the best fund managers can outperform the broader indices by a solid amount. Insider Monkey’s flagship best performing hedge funds strategy returned 17.4% year to date and outperformed the market by more than 14 percentage points this year. This strategy also outperformed the market by 3 percentage points through November 2nd despite the market volatility (see the details here). That’s why we believe hedge fund sentiment is a useful indicator that investors should pay attention to. Let’s take a peek at the recent hedge fund action surrounding Paypal Holdings Inc (NASDAQ:PYPL). At Q3’s end, a total of 97 of the hedge funds tracked by Insider Monkey were long this stock, a change of 13% from one quarter earlier. 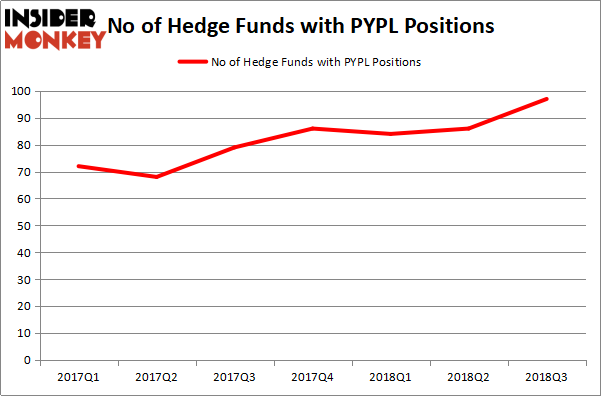 Below, you can check out the change in hedge fund sentiment towards PYPL over the last 7 quarters. With hedgies’ sentiment swirling, there exists a few key hedge fund managers who were increasing their stakes considerably (or already accumulated large positions). 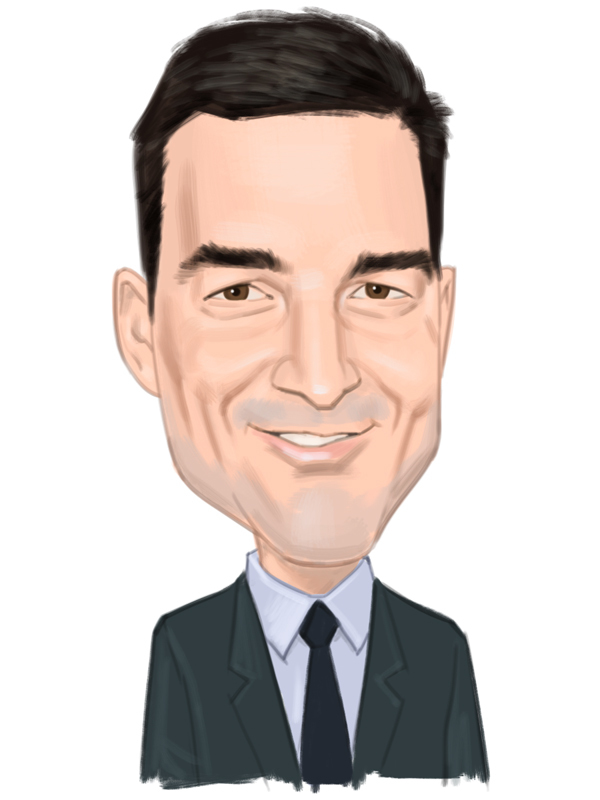 According to publicly available hedge fund and institutional investor holdings data compiled by Insider Monkey, Third Point, managed by Dan Loeb, holds the largest position in Paypal Holdings Inc (NASDAQ:PYPL). Third Point has a $795 million position in the stock, comprising 5.6% of its 13F portfolio. The second largest stake is held by Lone Pine Capital, led by Stephen Mandel, holding a $523.7 million position; 2.7% of its 13F portfolio is allocated to the company. Remaining professional money managers with similar optimism include Philippe Laffont’s Coatue Management, D. E. Shaw’s D E Shaw and William B. Gray’s Orbis Investment Management. Now, specific money managers have jumped into Paypal Holdings Inc (NASDAQ:PYPL) headfirst. Duquesne Capital, managed by Stanley Druckenmiller, initiated the most valuable position in Paypal Holdings Inc (NASDAQ:PYPL). Duquesne Capital had $63.9 million invested in the company at the end of the quarter. Robert Boucai’s Newbrook Capital Advisors also initiated a $63.8 million position during the quarter. The other funds with new positions in the stock are Alexander Mitchell’s Scopus Asset Management, Jeff Lignelli’s Incline Global Management, and Louis Bacon’s Moore Global Investments. Let’s now take a look at hedge fund activity in other stocks similar to Paypal Holdings Inc (NASDAQ:PYPL). These stocks are Costco Wholesale Corporation (NASDAQ:COST), Broadcom Inc. (NASDAQ:AVGO), Bristol Myers Squibb Co. (NYSE:BMY), and United Parcel Service, Inc. (NYSE:UPS). This group of stocks’ market values are similar to PYPL’s market value. “We see parallels between PayPal and other best‐in‐class internet platforms like Netflix and Amazon: high and rising market share, untapped pricing power, and significant margin expansion potential. PayPal is in the process of evolving from a pure‐play “checkout button” to a broader commerce solutions platform, expanding into adjacent verticals (e.g. in‐store payments, B2B) organically and through M&A. We forecast above‐consensus EPS growth driving shares to $125 within 18 months, for ~50% upside. In the near term, we see three large incremental revenue opportunities for PayPal: (1) Venmo monetization, (2) dynamic pricing, and (3) offline payments. PayPal is just starting to monetize Venmo, a P2P (Peer to Peer) platform that has grown 25x in four years, and now accounts for ~10% of PayPal’s transaction volume. PayPal launched a “Pay with Venmo” button in early 2018 for commercial transactions, as well as a new Venmo‐branded debit card that consumers can use to fund commercial transactions both online and offline. We think Venmo can contribute $1 billion in incremental annual revenue for PayPal within three years. Second, PayPal is just scratching the surface on pricing power: the company recently shifted away from a “one‐size‐fits‐all” approach in merchant contracts to a dynamic pricing model that reflects the value‐add of a growing suite of products. Finally, in May 2018, PayPal announced the $2 billion acquisition of iZettle, a fast‐growing provider of mobile POS systems for offline merchants in Europe and LatAm. We expect iZettle’s growth to accelerate as PayPal cross‐sells iZettle into its existing network of 19 million merchants. This deal takes PayPal from the world of online commerce ($3 trillion in global addressable spend) to that of offline commerce ($21 trillion in global addressable spend). We believe PayPal has multiple top‐line drivers in the years ahead, with core online volume growing in the mid‐ 20% range, latent untapped pricing power with merchants, Venmo on the cusp of monetization, and the potential to gain scale in the vast offline payments market. In addition to faster revenue growth, we also expect more cost discipline from management. Despite revenue scale approaching that of peers, PayPal’s 25% operating margin on net revenues (after transaction costs) is ~20‐40 points lower than that of large‐cap payments peers (e.g. Visa, Mastercard, WorldPay). Margins are an area where PayPal management has a clear opportunity to deliver, even as the company invests for the future. We think there are opportunities for expense reduction in IT (PayPal just completed a company‐wide tech infrastructure overhaul), customer service (half of the company’s 18,000 employees work in customer service, a function that can increasingly leverage automation), and credit servicing and collections (PayPal can reduce overhead in its consumer credit business, which was recently sold to Synchrony Financial). Moreover, PayPal’s changing relationship with eBay presents opportunities on both costs and revenues. PayPal can cut substantial costs associated with its legacy eBay contract while capturing incremental revenue by signing new contracts with eBay’s faster‐growing competitors (PayPal’s ability to work with eBay’s competitors was restricted under the terms of the legacy eBay contract, which is set to expire in 2020).